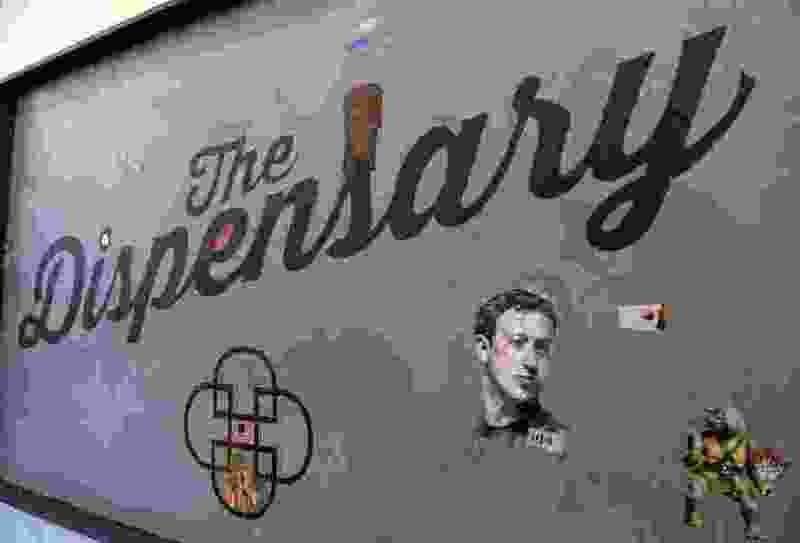 (Al Hartmann | The Salt Lake Tribune) The "perpetual collage" is starting to take shape at The Dispensary, a new Salt Lake City restaurant that encourages customers to play and create experiences. But this new eatery is in Utah, where marijuana is against the law. So pot pies — made with all-legal ingredients — will be the signature dish. The restaurant, in a new space at 54 W. 1700 South in Salt Lake City (next to Sweet Lake Biscuits & Limeade), is expected to open Monday, April 30, said owner David Heiblim. Heiblim, who opened Salt Lake City’s Este Pizza in 2004 when he was just 26, had originally set April 20 as the opening date, but ran into inspection and construction delays. The 4/20 date was not random, as the number 420 is universal slang for smoking pot and April 20 is considered a holiday for the cannabis culture. The easygoing Heiblim took the delays in stride. They just add to the anticipation for dining fans, who recently helped the owner raise $6,000 through an online crowdfunding campaign. “I want people to come in and be curious,” Heiblim said. (Al Hartmann | The Salt Lake Tribune) David Heiblim, left, and girlfriend Annie Kent play a card game at The Dispensary. The new restaurant, which encourages customers to play and create experiences, is expected to open this week at 54 W. 1700 South, Salt Lake City. Before dispensaries in other states became the place to buy legalized marijuana, the moniker was just another name for a pharmacy, he said. The restaurant is even set up like a pharmacy: Order at the first window, pick up at the second — and, if you return your dirty dishes to the third window, you’ll be rewarded with a treat. There will always be four pot pie options: chicken, vegetable, a seasonal offering and a pie made with the help of another Utah restaurant. Salt Lake City tapas restaurant Finca has created the first collaboration pot pie for the opening. Prices range from $8 to $16. Sides, like sautéed greens, taro chips and fennel slaw, as well as cookies, brownies and other sweet edibles made by local bakeries, also will be available. The restaurant will open Monday through Friday at 11:30 a.m. and will close when the food runs out, said Heiblim, who hopes to avoid food waste by limiting the amount of food made each day. After the restaurant closes, Heiblim says the space will be available for community groups to use for meetings or rent for events. Heiblim has stepped away from the day-to-day operations of Este Pizza — and its sister eatery Este Deli — and now just owns the licensing company for the two businesses. The move “decreased my income,” he joked, but also gave him the time to work on The Dispensary. The concept has evolved over several years and Heiblim even wrote a personal “manifesto” that helped him turn his thoughts into reality. 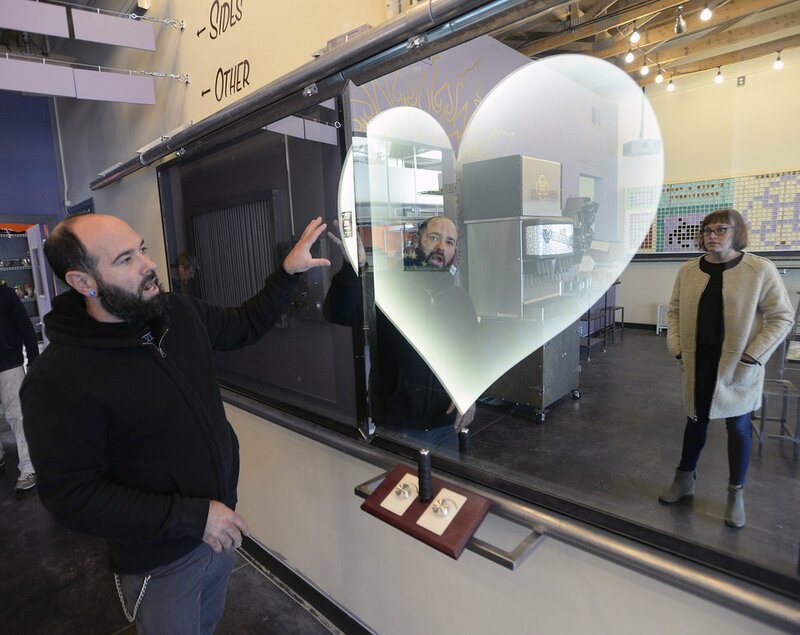 (Al Hartmann | The Salt Lake Tribune) David Heiblim, owner of The Dispensary, shows one of the interactive games at the soon-to-open Salt Lake City restaurant. Healthy eating, personal interactions and helping adults “relearn” how to play and have fun are themes he has incorporated into the restaurant through communal tables and artwork that customers can play with or add to. Make a design with the interchangeable colored blocks on the west wall; cut a picture from the stack of magazines and Mod Podge it to the perpetual collage; or bring a favorite poem or picture and place it behind an illuminated one-way mirror. Heiblim is thinking of other ways to create more human interactions — and fun. Don’t be surprised, he said, if the place breaks into a dance party at lunch, or a server asks you to answer a question about your favorite childhood memory or your most embarrassing moment before you get your food. That’s a natural high that’s already legal in Utah. Clarification: This story has been updated to include a new opening date.